Oklahoma Connection | Kerr, Jr., was born in Ada, Oklahoma, in 1926, the oldest of four children to Robert S. Kerr and Grayce Breene Kerr. “My father cultivated this taste, coining the rhythmic phrase of ‘Land, Wood and Water.’ As he often told me, these were his objectives when he set out to find a home in the old Indian Territory…” - Robert S. Kerr, Jr.
A native of Ada, Oklahoma, “Mr. Water” Robert S. Kerr, Jr., graduated from New Mexico Military Institute in 1944 and received his bachelor’s degree in 1951 and law degree in 1955 from the University of Oklahoma. He served in the Merchant Marine from 1945 to 1947, as a First Lieutenant in the U.S. Army from 1951 to 1953 and as an Army Captain from 1953 to 1957. Upon the death of his father, Senator Robert S. Kerr, the Kerr Foundation, Inc. was formed in 1963 and Kerr served as a trustee throughout his life. He also served as a trustee on numerous boards including Oklahoma City University, Oklahoma United Methodist Church Foundation, OU Board of Visitors, the President’s Air Quality Advisory Board, and the Oklahoma Water Resources Board. 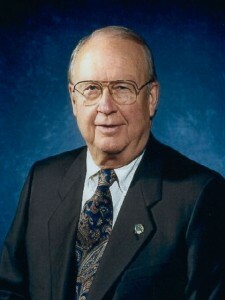 He was instrumental in the issues of Water Resources for Oklahoma and served as president of Oklahoma Water, Inc. and the Water Development Foundation of Oklahoma. In addition to his successful law practice, Kerr served as a director of the Kerr-McGee Corporation and president of Kerr Aviation Services of Oklahoma City.